Back in July 1993, a young Nigerian midfielder grabbed a game by the scruff of the neck and set his side on the way to their first ever FIFA World Cup™. Almost a quarter of a century later, his nephew scored the goal that took Nigeria to their sixth global finals. Jay Jay Okocha’s second cap for his country saw the then 19-year-old score a superb free-kick equaliser in a World Cup qualifier against Algeria, a game his side would go on to win. Some say Okocha’s performance that day was a pivotal moment in his country’s campaign on the road to USA 1994. Alex Iwobi may be a couple of years older than his uncle was when he scored that crucial qualifying goal, but his youthful exuberance played its part in the strike that sent the Super Eagles soaring back to the world stage. On as a substitute in the tense Group B tie against Zambia, the Arsenal man had been on the pitch less than ten minutes before he arrived at just the right time to stroke home Abdullahi Shehu’s cutback from the right wing. The Uyo crowd were sent into delirium, much like the Lagos faithful were in July 1993 – three years before Iwobi was even born – when his uncle sent them into raptures with his superb set-piece. Unsurprisingly, comparisons have been made throughout Iwobi’s career. Uncle Jay Jay was once asked who Iwobi admired as a child. “It should be me, I’d be disappointed if it wasn’t!” Okocha told Joe.co.uk. Iwobi’s observation is certainly accurate. Okocha went on to play at the 1994 World Cup that he helped his country qualify for, followed by France 1998 and Korea/Japan 2002. 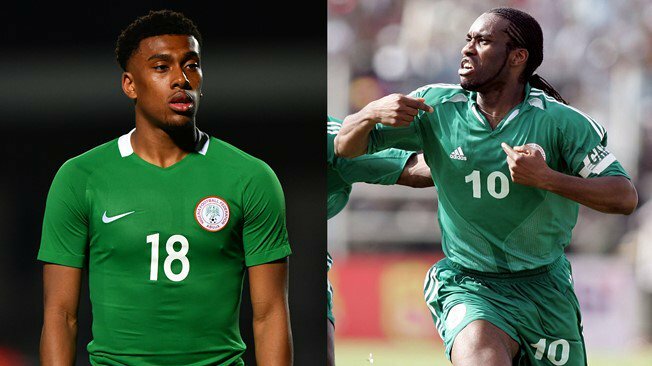 Russia 2018 now awaits Iwobi, and one presumes uncle Jay Jay will be watching on with beaming pride.